JBC Tools T210-A Precision Purpose Soldering Handpiece. The JBC T210-A is perfect for accuracy soldering jobs with medium power requirements. For its size, it is able to work with conventional or small SMD, even under a microscope. Its ergonomy and the short distance tip-to-grip ensure greater accuracy and comfort is perfect for accuracy soldering jobs with medium power requirements. For its size, it is able to work with conventional or small SMD, even under a microscope. Its ergonomy and the short distance tip-to-grip ensure greater accuracy and comfort. 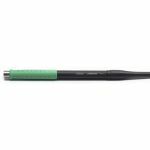 Purchase JBC Tools T210-A Soldering Handpiece sold by Howard Electronics Today!